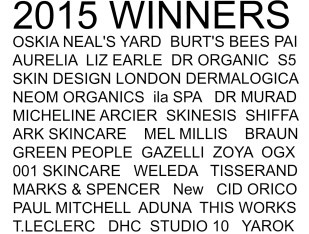 Congratulations to all the 2015 BEAUTY SHORTLIST AWARDS WINNERS & FINALISTS! Here are the winners and two finalists in each category. This year some categories were such a close call that in some categories two brands or products have tied. Thank you so much for this fantastic accolade! We are so delighted to have our Scandinavian Bath and Body Scrub awarded as finalist in the Best Body Scrub category in this year’s awards. The Beauty Shortlist is a great accolade and as always it’s been wonderful to see the diversity of brands entering and being awarded. Thank you so much for recognizing the Nano-b toothbrush in the category that matters so much for us – Best Health Breakthrough. We’ll keep working hard to improve everyone’s oral health! So pleased to have won Best Health Supplement – Overall Wellbeing with our Nosh Detox Raw Booster Sachets. And to be a Finalist with our Nosh Raw Energy Bar Best Healthy Snack or Food Bar! Absolutely delighted to attain ‘Finalist’ status for our Village Barber Aftershave Balm! Particularly when you look at the phenomenal competition in this year’s awards, it makes the achievement even more special! Great news for us and a wide selection of top brands represented here.